Offering a free night or two to paying guests isn't the most original promotion from luxury hotels these days, but our deal-filled in-box signals a trend that's here to st ay. Until the economy picks up and hotel occupancies bounce back, anyways. Here are few of the latest enticements to land in our lap this week: At the brand new 11-suite Tintswalo Atlantic on the ocean in Cape Town (where I'm seen--in the white top--enjoying breakfast with friends), stay for three nights and you'll only pay for two. Nightly rates from $710/room include a gourmet dinner on arrival, daily breakfast (check out the oceanfront spread!) and afternoon tea plus complimentary shuttle service to the V&A Waterfront. Extend your stay in South Africa and experience any of the Tintswalo properties (including Tintswalo Safari Lodge and Tintswalo Waterfall, a lovely 16-suite boutique hotel outside Jo-berg) for seven nights, while only being billed for six. Book through us and we'll get you spa treatments, wine and more thrown into the deal. Enjoy a different style of posh (and surprisingly affordable) living in Vegas at Palms Place Hotel & Spa. This 599-suite pleasure palace not only offers a $259 nightly rate (inclusive of a one-way airport limo transfer and accommodations in a 1,200 square-foot suite) but kindly throws in the the third night gratis. 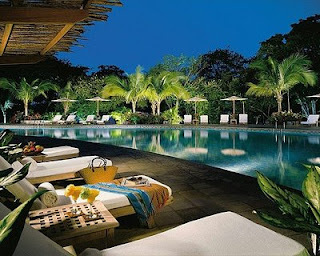 A fifth night free at Four Seasons Wailea at Maui could be just the remedy for early winter blues. Offered Jan. 4-17, Jan 23-Mar 12, and April 19-June 26 (and again on select fall '09 dates), this deal applies to all rooms/suites except the lowest-priced mountainside rooms and the ultra-swanky Maile Suite. Sister property Four Seasons Costa Rica also has a fifth-night free program in play in 2009, as well as a "pay for five, get the 6th and 7th free" when booking a two- or three-room private residence Jan 5-March 12. Come summer, families who pay for one room will get a second for the kiddies at half the price. Exclusive: Book your Costa Rica stay through Elite Travel International, and enjoy VIP treatment and Preferred Partner perks such as daily breakfast and a round of golf!